Monthly charts show build up of stiff resistance is at 6375-6400 levels. Crossover and sustaining above 6400 will lead to a blast. Note RSI is also developing resistance around current levels. Consider a trend reversal only if nifty closes below 5900. 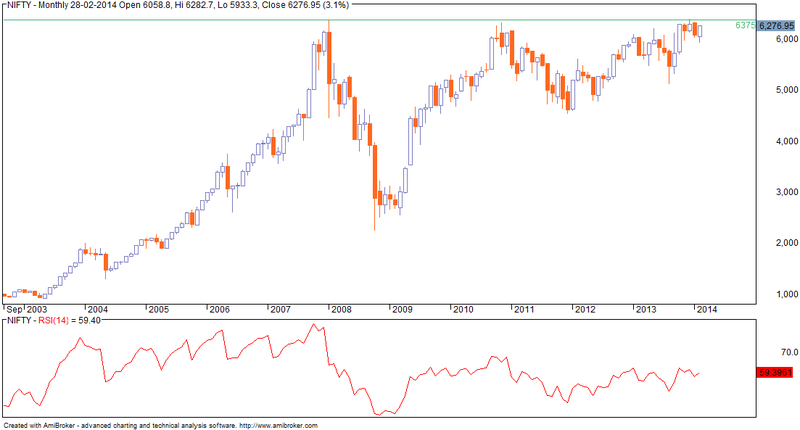 NIFTY closes at highest level for this week... RSI is also nearing recent highs. 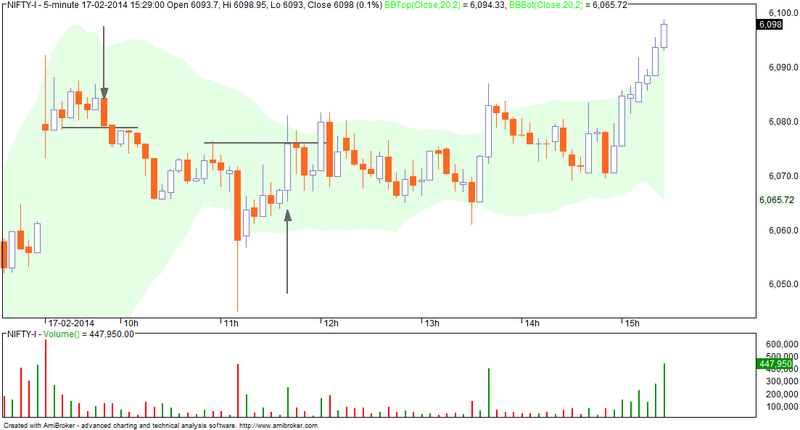 Gapup opening and then nifty trades in the range formed by the first 5 min bar. Nothing can be done on a day like this as the range is small and the range high/ lows are not crossed. 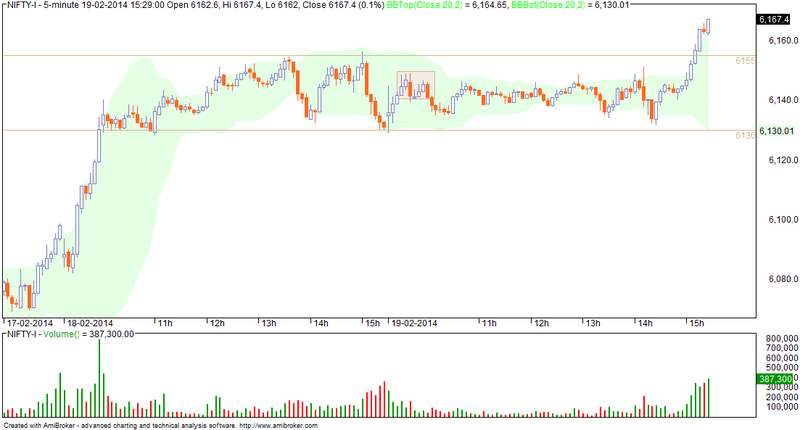 NIFTY trading in range formed by first 5 min bar... and VIX is increasing!. Trend is still up as nifty forms higher highs and higher lows. Option writing clues point to support at 6000-6100 and resistance (minor) at 6300. This is tentative and as per March series data. Final figures will be available post Friday market close. Initial bias was mixed... however markets crossed day's high AND previous days high by 10am. Along with this buy signal there were 2 more buy signals. However trading this could have been emotionally difficult because of the upper tails formed on the breakout candlesticks. While this indicates selling, it is NOT a short situation as the trend has been up. Silver gave a breakout last week when it crossed 46000. Now it is trading rangebound and this has resulted in SL moving from 45000 to 47000. Consider trend as still up with immediate resistance at 50000 and then 52000. In USD charts, GOLD has started a nice rally. Support is at 1275 and strong resistance at 1350-1375 levels. NIFTY maintains sequence of higher highs and higher lows. In other words, trend is still up and we will consider signs of reversal only if some recent significant low is broken. Inability to sustain above day's high (6220F) led to a sell bar which broke day's low. This was the first sell signal (first arrow). 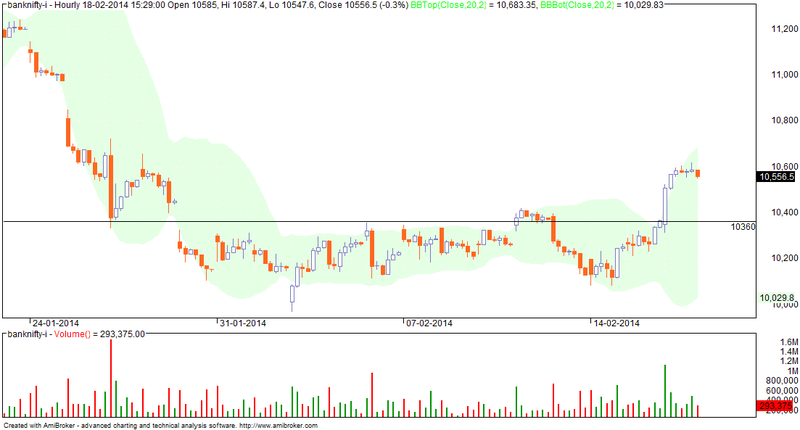 BNF trend is up with support at 10400 and resistance at 10800. Above this, next resistance is at 11250. Note that these are futures levels and will have some gaps around expiry levels. NIFTY trend remains up. 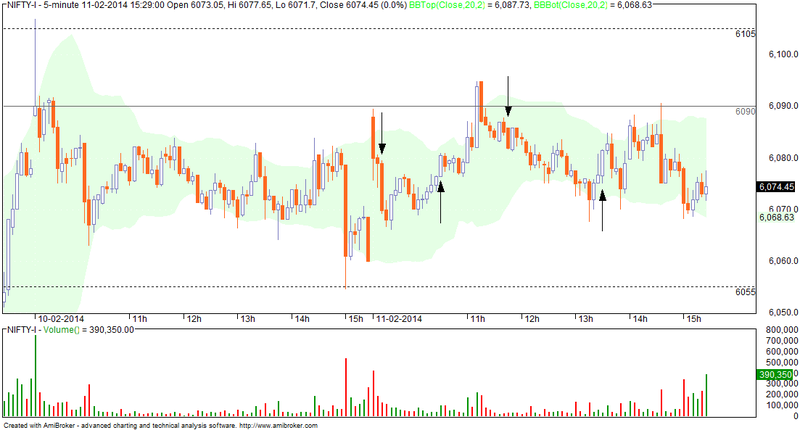 We have minor swing low at 6080 spot or alternatively, any of the last 3 day's low can be considered as a tight SL. 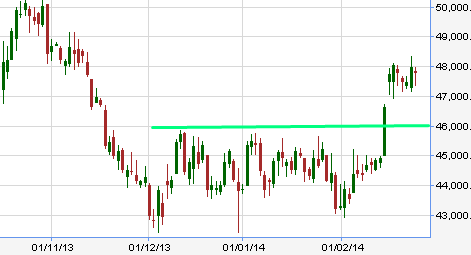 Looking forward, we now have a gap resistance in region 6200-6300. Initial bias was rangebound. We had swing high formed around 6150F. Depending on your approach, you could have taken a long position at any of the 3 arrows marked. NIFTY closes at weekly high. A close near weekly high is usually bullish (and vice versa). 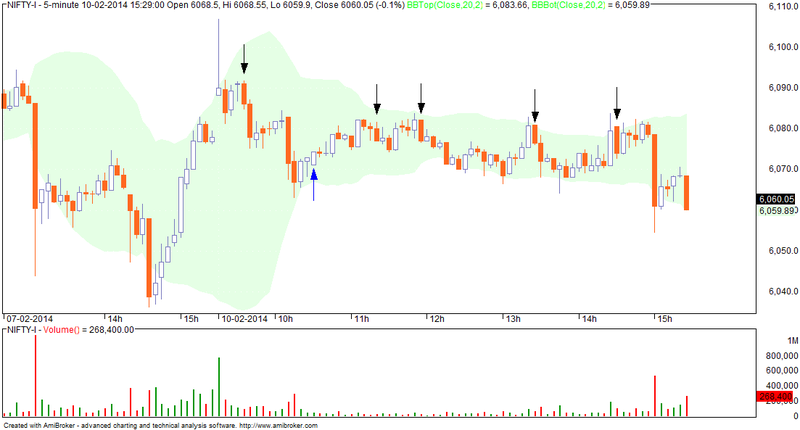 On intraday charts, BNF became a buy above 10500F with trailing SL exit at 10570F. The day's high made around this time i.e. 10600F was never crossed later in the day. First 3 bars were neutral despite the large size of the first bar. The 4th bar gave the buy signal at 6135F. We got 2 trailing stoplosses the last of which got hit at 6150F. There were no signals later on. I ignored the short signals as this would have been against the broader trend. I could not capture the last rally from the lows of the day as the signal came in only around 6150F and which also happened to be near the highs of the day. On 15 min charts, trend has turned down with resistance at 10500F... trading above this will be bullish. Downside, expect support at 10200-10300F. Today we had an interesting day where markets opened gap down below the low of the previous day (yesterday was an up day). Usually this signifies trend reversal so chances are high of more downsides from current levels. Option writing clues are not giving any clear direction. Open interest (MARCH series) is highest at 6000 put followed by 6200 call - the difference is not much and unless we have highest open interest in calls, it will be difficult for markets to come down. For tomorrow, trading above 6140F will be bullish. Markets opened with a gap down and at the support formed over last 2 days (6130F). Short signal got activated in 3rd bar (first arrow) and we got stopped out just after 10am. No long positions recommended as bias is down. On EOD charts, trend is up with support at 10300 and resistance at 10800 F.
NIFTY closes above 6100 for second consecutive day. Consider trend as up as long as nifty trades above 6100. Failure to this would increase chances of a whipsaw. Also, focus on intraday level of 6130 F for any signs of reversal. 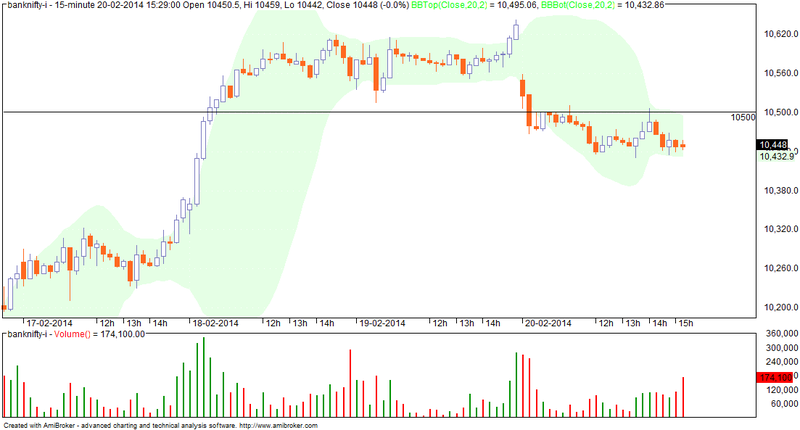 Markets opened in yesterday's trading range of 6130-6155F. A trading range of 25 points makes trading very difficult. Normally when markets trade in a tight range, it is best not to do anything. At times like this, signals usually fail. Box shows setup conditions for a short trade (upper tails). This trade got stopped out later on as markets remained in a range throughout the day. Towards the end of the market there was a range breakout... however this came late to be of any use. 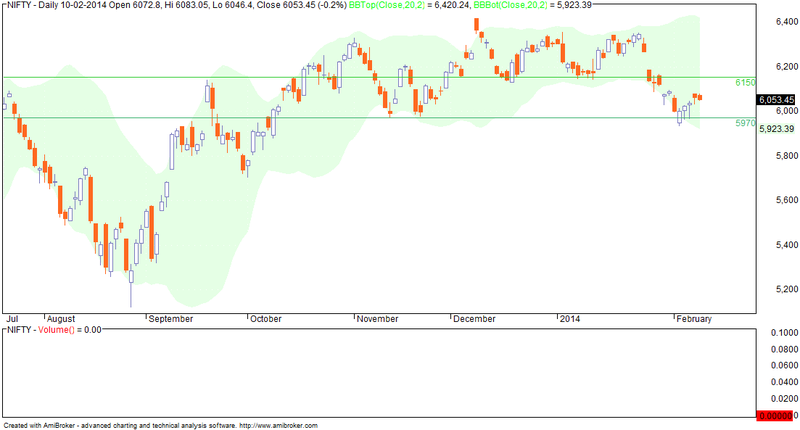 Nifty has closed above recent minor swing high. This has bullish implications but has to be considered in light of the broader rangebound movements and resistances nearby. 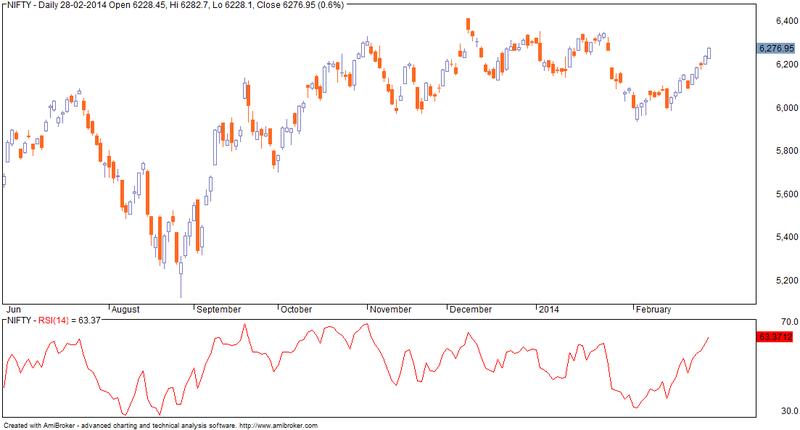 For failure of this signal, nifty must break and close below 6050 in next 2 days. Trading within today's high low would be considered as a part of this new uptrend. Option writing points to support at 6000 and diminishing resistance at 6200. This means option writers do not expect 6000 to break this series but do not feel the same about 6200 levels. Today was a nice trend day... the trend was up as nifty took out yesterday's high and we had a nice big bull bar. Buy signals are as indicated. We had a hit of trailing SL between 1 and 2 pm. This is NOT a sell signal as trend was strongly up and any anti trend is likely to fail. Subsequently there was selling at 6150F levels. But the swing low is at 6130F and only a close below this would confirm possible change of trend (intraday). Let us see how well this hold over the next few days. 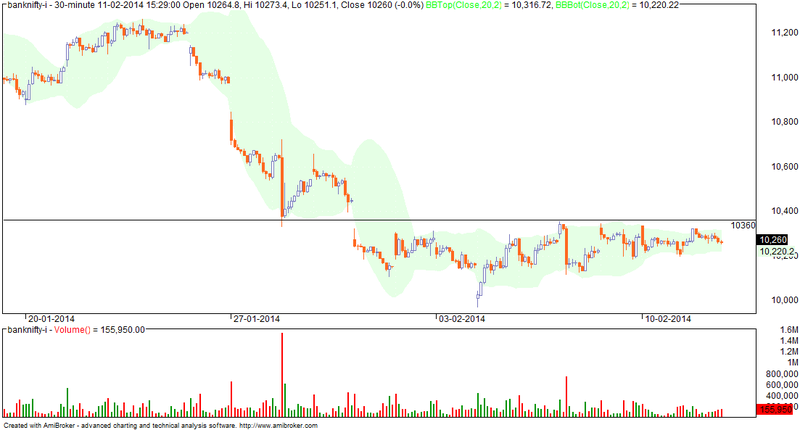 The level of 13350-10400F.... which offered resistance earlier should now offer support. Complete or faster reversal of today's rally will mean resumption of prior trend i.e. down. Markets are trading in a range with support at 5970 and resistance at 6100. VIX has dropped 5% indicating reduced fear. A breakout above 6100 is possible but it is important to see the closing. Unfortunately there is a bigger resistance at 6200 (gap, call writing). On a different note, markets showed peak at 6100 in JAN, JUL and SEP last year. So on a year to year basis, markets are roughly at the same level today where they were a year ago. First bar was a doji with selling at higher levels. There was no buying in next 3-4 bars. Finally we had a sell signal (arrow). This trade however did not much and we got stopped out (2nd arrow). Since bias was neutral, there was no reliable signal from here on. The day's trading was also small and markets were close to the overhead resistance at 6100F. This was more a day of just sitting on the sidelines. 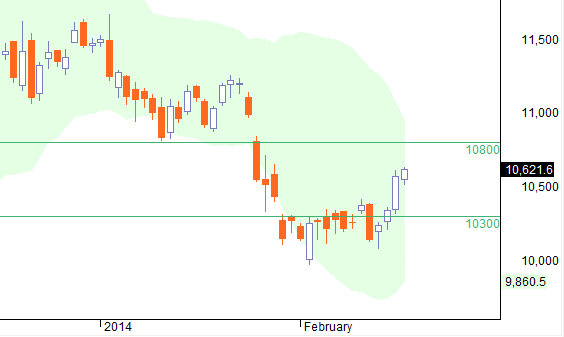 On daily charts, nifty is still in a range defined at 5970 and 6100. While Thursday showed a clear trend reversal, today's bar indicates bullishness with support coming at lower levels. VIX also dropped by 6% indicating diminishing fear in the markets. Initial bias was for a short signal (first arrow) but this could be skipped as previous day's low was nearby. The second arrow was actually a tradable / safe buy signal but this did not move well. This was the only trade I took today and was mildly profitable. After a series of higher highs and higher lows, we had the first biggest fall this month with nifty losing over 1.4%. Note that the recent rally was painfully slow averaging 20 points a day. In that sense, today's big fall marks a trend reversal and also sets up a swing high at 6100 levels. This also means that any long position should be considered only above 6100 levels. However we still have option writing support at 6000 and call writing resistance at 6200. It will be interesting to see what happens from here on as markets are exactly at supports. Difficult to visualize any long position at this point. 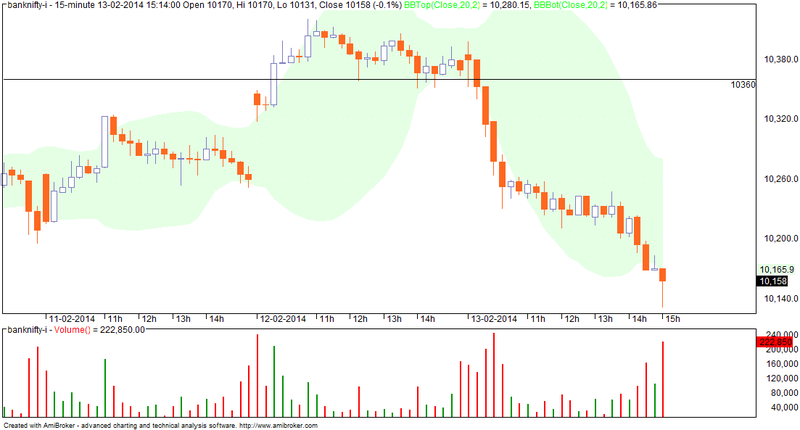 Yesterday's breakout was flat with the index hardly showing much strength after trading above 10360. 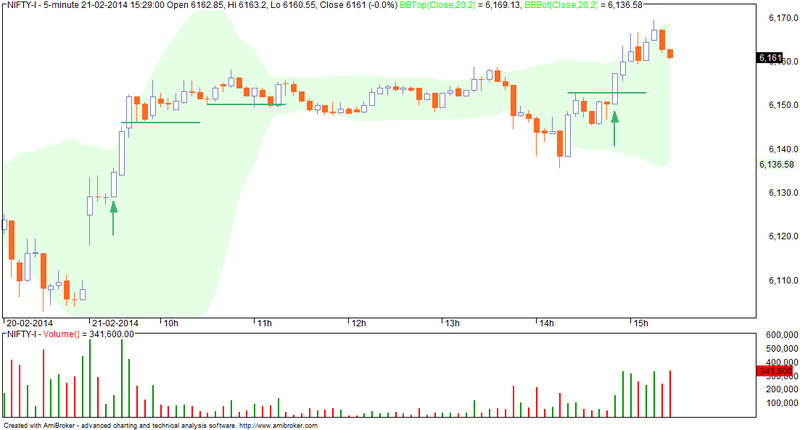 The 15 min chart shows the strong selling in the index. Now expect the level of 10260F - 10360F to provide strong resistance. Break of previous day's low (first line) was a probable short signal. However I did not consider this as the bar which formed subsequently looked bullish (thanks to lower tail). 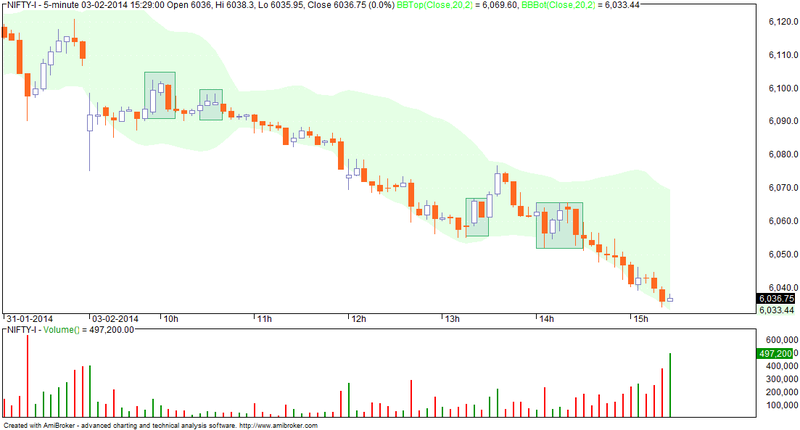 Break of the second line was a short signal.... covered around 6050. In hindsight the covering did not make sense as the trailing SL was never triggered and there was no buy signal through out the day. 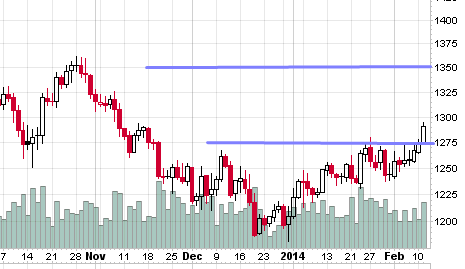 On candlestick charts, we have breakout level at 1275 and resistance at 1350-1400 USD. Fast break of 1275 would negate the current bullish view. We had what looked like a breakout but it was nothing remotely close to one. Normally one would have some short covering or buyers jumping as levels are broken. Nothing of the kind happened. We got a small doji with a tiny body indicating persistence of selling at higher levels. First bar was a breakout bar ending a doji with a wide body ... neutral implication. Now last few days, markets have been selling off on the first bar so accordingly there was some selling but this was weak. The 9.45 bar showed buying emerging and crossover above the first line was the buy signal (shown in blue arrow). Looks like we are having a breakout on BANK NIFTY... holding day's low will be bullish. 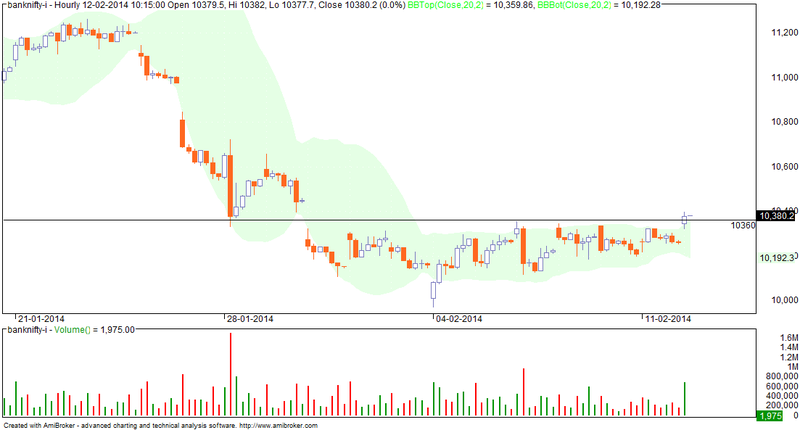 I am not having any targets but if this breakout remains valid, then BNF should move a lot (time wise, price wise). Support below 10300 F Resistance 10600-10800 F.
Trading in futures is risky because of the leverage and the effect it has on under capitalised traders and their emotions. However similar problems do not arise in delivery trades specially when trade size is very small. If your transaction size is say INR 5,000 then you can manage a trade far better than if it was say INR 50,000 or INR 200,000. NITFY is peculiarly poised... the broader trend is down but taken support near 6000 levels. At the same time, we have signs of buying but this is clearly not strong enough to effect a strong breakout. So we have this situation where global markets are moving whereas our markets are being sold into right from the first bar. Option writing clues are however a bit predictable... good support at 6000 and resistance at 6200. What will happen if there is a breakout? How will the shorts react? NIFTY has been rangebound for some time now. The dotted lines refer to previous day's high/ lows. First bar of the day saw selling. Short trade came on 3rd bar... but this was stopped out around 10.35...(2nd arrow). Thereafter it did not make sense to take any trade as a long position was anti-trend plus the fact we were close to a selling zone. The subsequent short trade did not generate any profits. This index is a non participant in the current market... on 30 minutes, it is rangebound and the breakout level is 10360F. Crossover and sustaining above this level will be bullish. Else weak. Last week, we had hammers for 3 consecutive days and markets maintained formation of higher highs and higher lows. Today was the first day of the week and though we had very good global clues, markets failed to capitalise on this and traded weak throughout the day. Now while immediate trend is weak but still up, we will wait for a close below 6030 for initial signs of any weakness. 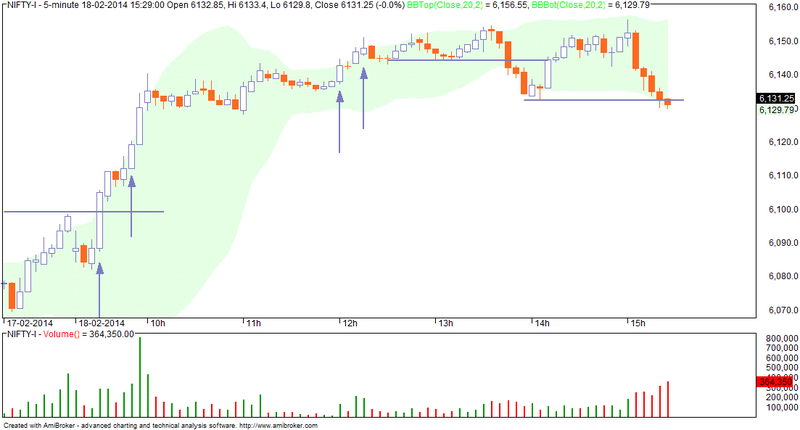 Note that broader structure of the market has changed ... it is more of sell on rise than buy on dips. Option writing points to support at 6000 and resistance at 6200. Global clues were very strong. 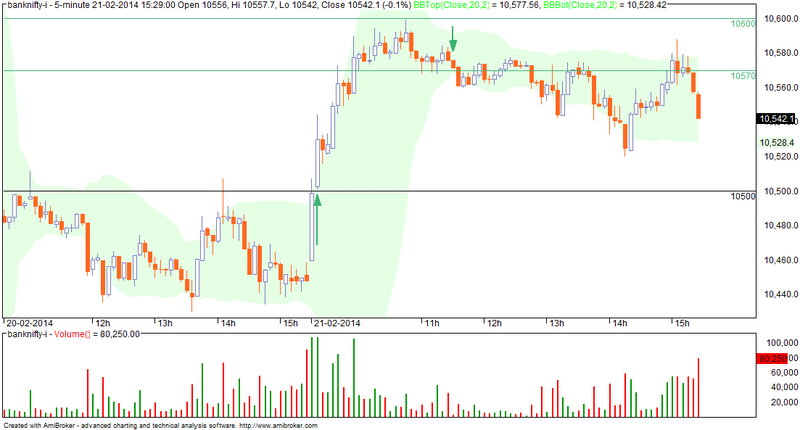 However first 5 minute bar of the day saw immediate selling and nifty closed towards low of the bar. First sell signal happened in 15-20 min as it was clear no buying was coming. We had a buy bar around 10.35 (blue)... however this was actually a cover of an existing short and not a fresh buy as the broader intraday trend was down. Subsequently we had 4 short signals but market was rangebound so nothing much really happened. Despite extremely good global clues, BNF failed to cross the resistance level. This possibly sets the stage for a cluster island reversal, a bullish pattern IF we get a gap up opening this Monday. Inability to cross 10350F next week will lead to bigger problems. First bar showed selling at higher levels. Break of horizontal line would have created first short opportunity as whatever buying was there fizzled out. Depending on where you had kept the SL, you would have been in trade the whole day (SL at day's high) or stopped out by 11.30am (SL at 6085F). 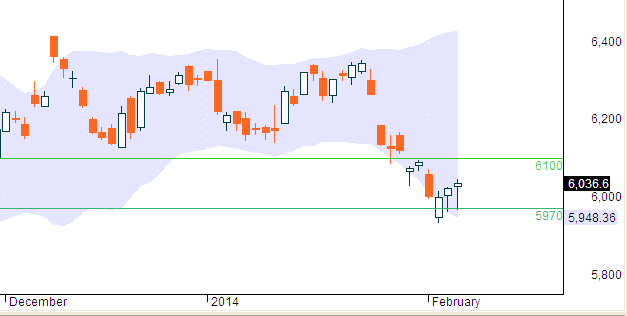 On daily charts, nifty has closed at the highs for the 4th consecutive day. In fact, this whole week we had formation of higher lows and higher highs. Weekly closing was towards the week's high and above 6000. But... the daily charts show small bodies with long lower tails indicating selling at every level. So we are having selloffs intraday followed by buying. First bar of the day showed selling at higher levels (upper tail). One bar is however not enough and a confirmation came in next 2-3 bars... these are shown in the first circle. Break of support (horizontal line) led to a short trade. Before this you can sense that there was some buying happening all of which failed. So the path of least resistance is down and you should short. Another day of selling followed by buying on dips. Last 3 days candlestick shows buying at lower levels and close near days' highs. Holding recent lows, expect market to show some small rally not crossing 6200. However the market is now more of sell on rise than buy on dips. A fall of 400-500 points is then possible as and when nifty forms a lower swing high. Option writing points to support at 6000/ 5900 and resistance at 6200. 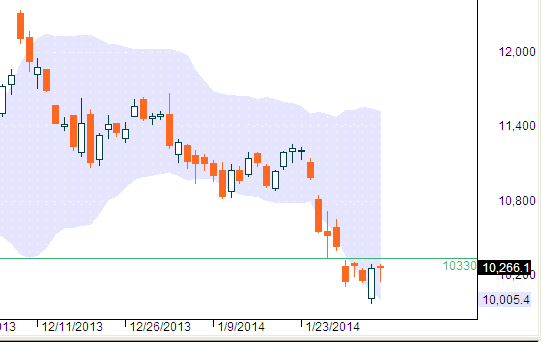 BANK NIFTY trend is down.. however past few days, it is trading rangebound and developing resistance at 10330. Now if you are short, this level will be your SL. Any long position should be considered only on hourly or lower timeframe like 15/30 min charts. Markets bounce off days' lows and closes at the highs of the days. Now overall trend is down so what we are seeing is a technical pullback or relief rally. This is along expected lines and should not exceed 6200-6300 levels. In other words, the markets remains a sell on rise and not a buy on dips market. Today for reference purposes, I will analyse using 1 min charts... I use both 1 and 5 min charts and sometimes 15 minutes to get a better feel of the market. On 1 min charts, initial bias was down/ tending towards short trades. The lines show the SL or trend reversal levels. Note that at this time nifty was weak but advance decline for entire market was positive. 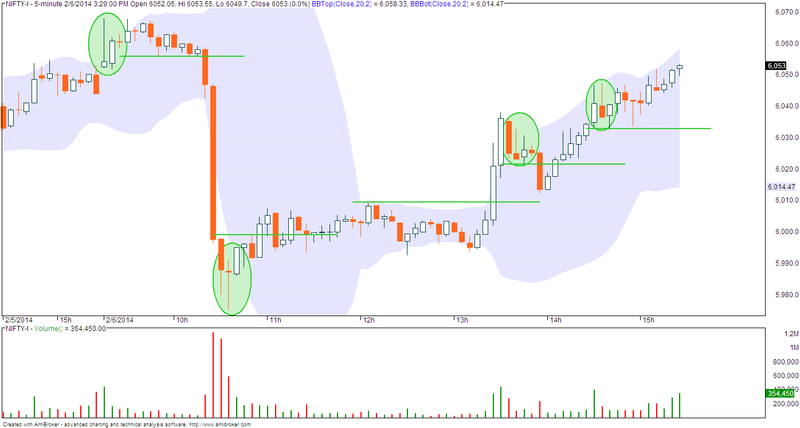 Buy signal was generated around 11.45 am and exit was triggered around 1.15pm giving 35 points profit. The next short trade took away 12 points. At this point, it does not make sense to take another trade specially when a sell gets stoplossed and leads to a buy (chances are high that markets may become rangebound). Markets take support around 6000 levels. Holding today's lows will be bullish for next few days as nifty may have a technical pullback/ relief rally to 6200 levels (gap). Note that character of market is changing from buy on dips to sell on rise. Option writing points to increasing support at 6000/ 5900 levels and resistance at 6200. Despite initial gap down, bias was bullish because of support at 5970-6000 levels. This was visible in the first 5 min bar and the low thus formed was never broken during the day. First box... short trade as we had a breakout failure. It is normal for the first breakout or a bullish breakout to fail as the broader trend is down. While broader trend is down, markets are near important supports which also happen to be psychologically important big round numbers. Accordingly we have increasing open interest at 6000 strike price even though markets closed in the negative. The open interest position implies limited downsides whereas the increase in VIX today shows fear at current levels. Let's see what markets do now. On a different note, we have formation of a minor swing high at 6100 levels. Immediate support still remains at 5970 spot. If this breaks, then severe problems. Possible signals/ trades are shown in boxes. 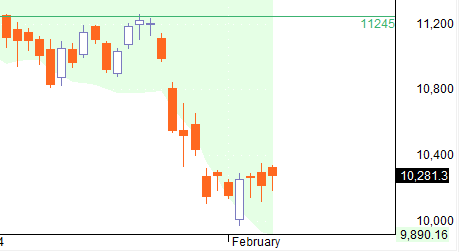 First box shows breakout failure as nifty crosses day's high and then reverses.